Set within an estate of oak groves in Montecito and boasting 14,000+/- sq. ft. under roof, this home is impressive beyond words. An almost entirely glass home it allows occupants to be feel comfortable inside by completely enveloping them within nature. 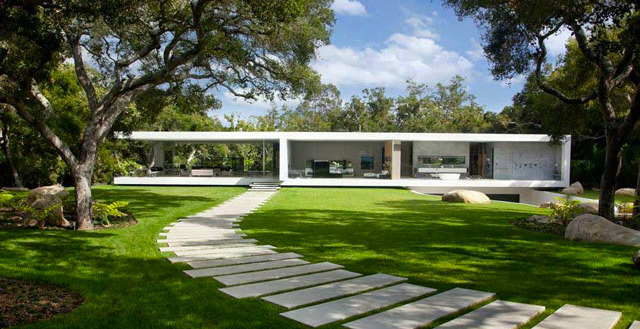 Through the use of massive structural steel beams, the home is able to appear weightless as it hovers above an expansive lawn. All of the large glass panels are Star Fire glass, an incredibly clear glass usually reserved for jewelry displays. The home has five bedrooms, five and a half baths, grand hallway and large wine room. The glass pavilion includes an art gallery where the owner currently displays their vintage car collection.